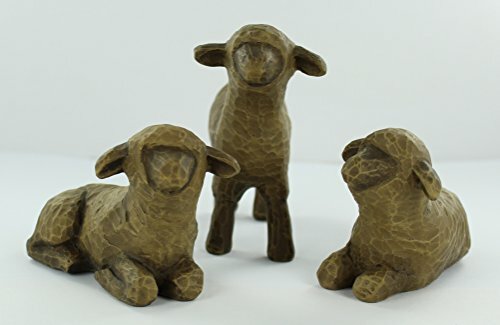 Three Black Sheep Willow Tree figurines includes two kneeling and one standing. These are part of the original four-piece Willow Tree Shepherd and Stable set. Use as a replacement pieces, or create your own custom nativity collection. Made of resin and is 3" in height (tallest). This item does not come in its original four-piece packaging because it is sold separately. The Balck Standing Sheep figurines are part of the original four-piece Willow Tree Shepherd and Stable set. Tallest item is 3" in height.